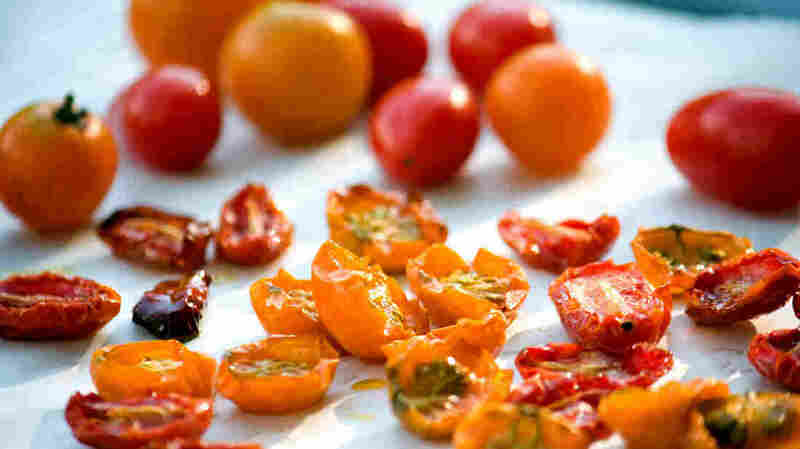 Roasted Tomatoes, The Perfect Accessory For Summer Dishes Dressed in caramel notes, with a suggestion of salt and a big wink toward vinegar, a roasted tomato's most memorable feature is its long, sensuous, deep and savory finish. Get recipes for Orzo Salad With Roasted Cherry Tomatoes, Toasted Pine Nuts And Basil, Pork Tenderloin With Roasted Tomato-Thyme Gravy and Roasted Tomato Tart With Caramelized Onions And Parmesan Crust. At this time of year, we all love tomatoes. Many of us claim we'll "take a big juicy tomato and bite into it like it's an apple," although you won't often see that happen in actual fact. Yet, even people who love a juicy fresh tomato also are likely to enjoy it with all the juice sucked out, as in sun-dried tomatoes and — especially — roasted tomatoes. It's the way the process acts on flavors, caramelizing what's on the outside, concentrating what's on the inside. It's true even for a soulless, pale-pink January tomato. You can count on roasting to isolate and spotlight whatever sugars are to be found in that poor, hardhearted, well-traveled specimen. But when you roast an August tomato — the Rita Hayworth of nightshades, seething in aromatic volatile compounds, complex with the sweetness of captured sunlight, intrinsically tart with citric and malic acids — well, then, you have something worth stopping the presses for. Dressed in caramel notes, with a suggestion of salt and a big wink toward vinegar, a roasted tomato's most memorable feature is its long, sensuous, deep and savory finish. It's a tone poem in umami, and by the time you reach the coda it's already instructed your brain to reach for the next. At first glance, when you start comparing people's methods for roasting tomatoes, you'll think the world has gone mad. Some tell you to roast at 450 degrees for 30 minutes. Some tell you to roast at 250 degrees for 3 hours. Others say 350 for 2 hours. What is going on? The thing is, they all work. All you're doing is taking out the water and browning the outside a little. You can do it fast, in which case it will be sludgy but luscious in the middle, with a slippery, detachable outside. Or you can do it slowly, in which case the texture will be more cohesive, uniformly tacky and chewy. Same great taste. How much does it change matters if you use cherry or grape tomatoes instead of full-size ones? The most important factor is how much air circulates around each piece of tomato, so smaller pieces will tend to dry faster. Just be sure to drizzle on some oil, and don't be shy — fat carries flavor, and there's a lot of flavor to carry here. Once you've got your roasted tomatoes, you can store them in the refrigerator for as long as it takes to use them up, and, trust me, it won't be long. The oil you so considerately drizzled over them when you were about to pop them in the oven will also help to keep them fresh. 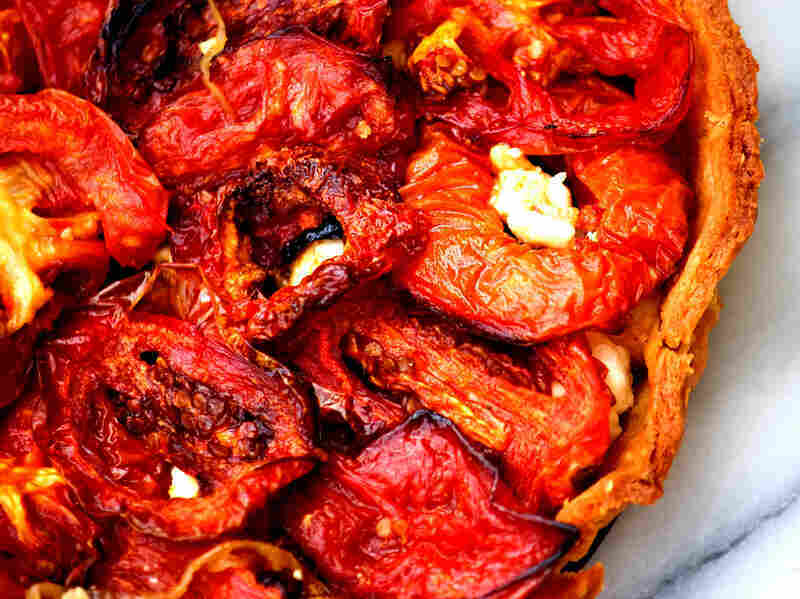 There are as many ways to eat a roasted tomato as there are cooks. You can tuck them into pastas and pasta salads with a drizzle of balsamic. They're sensational with basil, the eternal tomato sidekick. 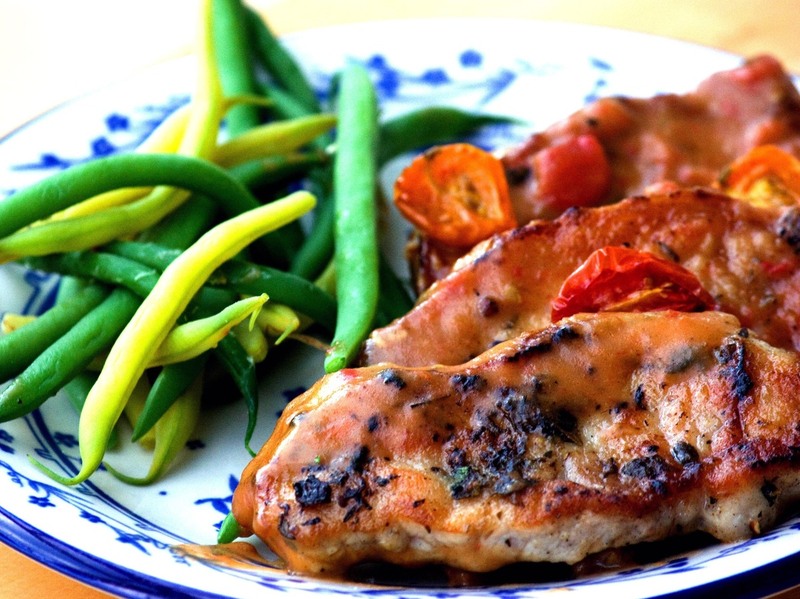 You can use them as a base for gravy whose depth and character will bring tears to your eyes. You can showcase them in a gorgeous tart, layered like russet roof tiles in a golden pastry frame. Or you can toss them with some crisp-crusted potatoes with maybe some flecks of olive, and spend a happy half-hour alternating tomato-potato bites in a partial swoon, unable to decide which you love more. It's a happy problem to have, and a specifically summer sort of happy problem, like whether to wear your strappy sandals or your cork wedges, or whether you should go for a swim or nap in the hammock. Enjoy it while you can — because while the roasted tomatoes of August may indeed be unforgettable, you certainly don't want to wait until they're nothing more than a memory. I think this very simple but satisfying salad looks loveliest if you have a mix of colors — maybe some orange sun gold cherry tomatoes mixed in with the red. Preheat the oven to 250 degrees (or 200 with convection). Halve the tomatoes lengthwise and toss with plenty of oil until they glisten. Arrange them cut side up on a foil-lined baking sheet with plenty of space in between and sprinkle with just a bit of salt. Roast for 1 hour and 15-30 minutes, checking every half-hour on their progress. If they start to turn a deep brown on their undersides, pull them right away — they're about to burn. You want them tacky and slightly shriveled but not completely dry. While the tomatoes are roasting, boil a pot of water. Cook the orzo according to the package directions, drain and toss with oil to prevent clumping. As it cools, toast the pine nuts over low heat in a small, dry skillet until they're evenly bronzed. 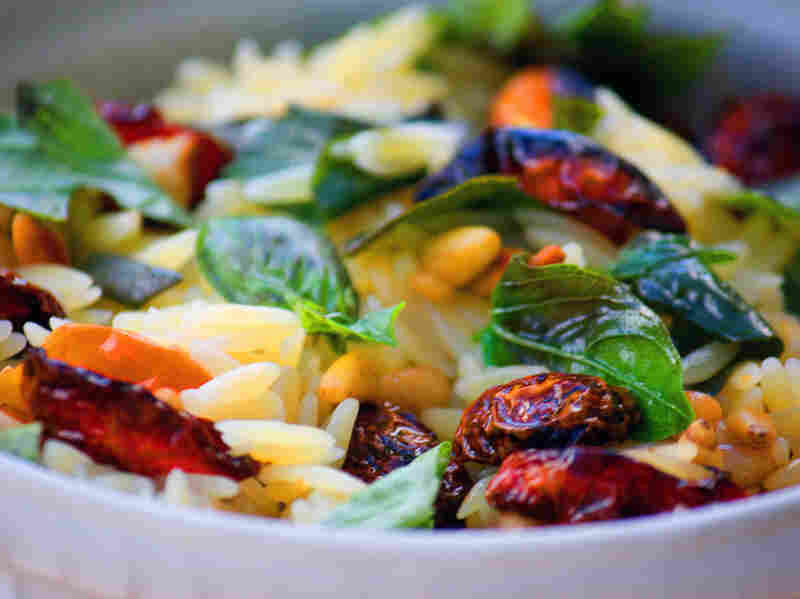 Toss the tomatoes, orzo and pine nuts together with a splash of red wine vinegar. Shred the basil by hand and toss at the very last minute, as both the vinegar and the heat are liable to make it discolor. Serve at room temperature. It's also good picnic food, tossed with a little more olive oil and served cold. This is high-heat roasting, enough to concentrate the tomato flavor, but not enough to dry out the pulp, so don't be surprised if the tomatoes remain a bit sludgy. The recipe is adapted from Sara Foster's Southern Kitchen (Random House, 2011). Foster suggests you serve it with buttermilk biscuits, which is great if you have the time. But the pork with its swoon-worthy gravy is memorable all by itself. Preheat the oven to 400 degrees. Place the tomatoes on a rimmed baking sheet and toss with 1 tablespoon of the olive oil and the vinegar. Season with salt and pepper to taste and bake for about 30 minutes, until the skins begin to shrivel and the tomatoes start to caramelize. Remove from the oven and set aside until cool enough to handle. Remove and discard the skins (they will slip right off) and roughly chop the tomatoes. While the tomatoes are cooking, rinse the pork, pat dry and remove any silver skin. Heat the remaining 1 tablespoon olive oil in a large skillet over medium-high heat until sizzling hot. Slice the tenderloin into rounds about 1/4- to 1/2-inch thick and sprinkle with the thyme and salt and pepper to taste, pressing lightly so the seasonings adhere. Dip the rounds in the flour to coat both sides lightly; reserve the remaining flour. Place the pork in the skillet and saute for about 2 minutes per side, until light brown around the edges. Remove the meat from the skillet, place on a plate and cover loosely. Add the butter to the same skillet and melt until sizzling hot. Add 2 tablespoons of the reserved dredging flour and stir to scrape any brown bits from the bottom of the skillet. Cook, stirring constantly, for about 1 minute, just until the flour cooks slightly and turns light brown. Whisk in the broth and stir until the gravy is slightly thick and smooth. Add the tomatoes and cook, stirring frequently, until the gravy comes to a boil and thickens, 3 to 5 minutes. Reduce the heat to low and return the tenderloin slices to the skillet with the gravy just to warm through. This is one of those tarts that come together in no time if you happen to have the roasted tomatoes and the caramelized onions already made. Otherwise, grab a glass of wine and a friend and prepare to hang out in an increasingly fragrant kitchen for a couple of hours. 1/4 cup water, in a measuring cup with a couple of ice cubes thrown in. Line a large baking sheet with parchment paper and lightly oil the paper. Slice the tomatoes 1/3- to 1/2-inch thick and lay them out, well-spaced, on the baking sheet. Drizzle with balsamic vinegar and enough olive oil so that the slices glisten evenly (if your olive oil pools and splotches, just grab a brush and baste the slices with it). Sprinkle with just a pinch of kosher salt. Roast for 1 1/2 hours, flipping the slices halfway through, until tomatoes are collapsed, but firm enough to turn with spatula, and a bit tacky and chewy. While the tomatoes are roasting, make the tart dough. In the bowl of a food processor, pulse the flour, salt and Parmesan briefly to combine. Add the butter chunks and continue pulsing until the mixture is coarsely combined (particles should be a mix of sizes, from sand- to rice- to pea-size). Add a tablespoon or so of water, and pulse a couple of times; repeat. Finally, add just a bit more water and pulse a few times until the dough begins to clump together in little pellets, smaller than a grain of rice. There should be almost no visible flour particles left in the bowl. Pulse two or three more times, so the pellets start to clump, and turn out onto a work surface. Shape gently into a disk about as thick as your thumb. Wrap in plastic and chill in the refrigerator for 20-30 minutes. Preheat the oven to 350 degrees. While the dough's chilling, caramelize the onions. Add the thin slices to a heavy, wide-bottomed pot with a generous pinch of kosher salt and enough oil to coat the onions. Stir them thoroughly to coat and then let them sweat, gently, over low heat, until they soften and their moisture has dampened the pan and then evaporated, about 20 minutes; stir as often as you have to so that they don't color at this point. If the pan is dry, add a half-cup of water and continue to cook for another 20 minutes or so until the pan is dry again. Add a tiny bit more oil — enough to help the onions glide over the bottom of the pan. They will color quickly at this point, so stir continuously until they are an even caramel color throughout. Add the anchovies, breaking them up with a fork and working them into the onions. Remove from heat. While you're minding the onions, you'll have enough time to blind-bake the tart dough. Remove the tart dough from the refrigerator and press it into a 1/3-inch-thick round with a rolling pin, using a little flour to keep the dough from sticking to the counter if necessary. Then roll it out into a 1/8- to 1/4-inch round. Place the dough in a fluted 9-inch tart pan with removable bottom. Fit snugly in the pan and roll a rolling pin over the top of the pan to cut off any overhang. Refrigerate for 10 minutes more. Place the tart pan on a baking sheet, set a sheet of parchment paper against the surface of the dough and fill with pie weights or dried beans. Bake for 10 minutes, until just pale gold. Prick the dough with a fork. Lower the oven temperature to 300 degrees. Spread the caramelized onions on the base. Crumble the feta cheese onto the onions. Layer on the roasted tomatoes in overlapping circles. Bake for 20 to 25 minutes, until the tomatoes are vibrant and slightly more shrunken and the feta has melted a bit. Unmold gingerly and serve.